The Brittany is a hearty, medium-sized, leggy dog. The dog's long legs are the same height at the shoulders as the length of the body. The medium-sized, rounded head is wedge-shaped, but not quite as wide as it is long. The stop slopes mildly. The muzzle is medium in length. The nose has wide nostrils and comes in fawn, tan, shades of brown or deep pink, depending on the color of its coat. Black noses are not permitted in the show ring. The teeth meet in a scissors bite. Eyes come in colors of dark brown to shades of amber and hazel, depending on the coat color. The triangular ears are set high, lying flat close to the head. The feet are small with well-arched toes and thick pads. The tail is set high, either naturally short or docked to 4 inches or less (10 cm). 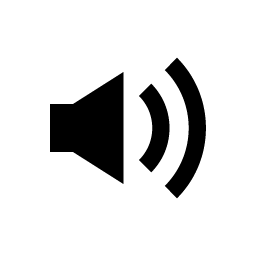 Note: it is illegal to crop tails in most of Europe. Dewclaws are sometimes removed. The single coat is lightly feathered, never curly, but dense, flat or wavy. All over the world the Brittany or Epagneul Breton accepts 5 colors: orange and white, liver and white, black and white, liver tricolor, and black tricolor, in either a clear or roam pattern, with some ticking. The USA (AKC) and Canada (CKC) do not recognize black. All other countries worldwide do accept all colors and follow the FCI standard of the breed. 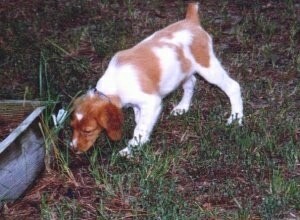 The Brittany is intelligent and easy to handle and train for hunting. It is a loving and gentle animal; obedient and always eager to please. Happy and alert, this vigorous breed is a very active and enthusiastic hunter. Affectionate, yet independent; it is a free-thinker. Good-natured and easy to care for. Brittanys that lack in mental and or physical exercise will become hyperactive and unstable as the energy builds up inside them. When they are not hunting they need to be taken out on daily pack walks where the dog is made to heel beside the handler. Never let them walk out in front, as pack leader goes first. They also need an owner who is firm, but calm, confident and consistent all at the same time, setting the rules and sticking to them. Brittanys that lack in mental/physical exercise and/or are not secure with their place in the pack may become nervous and/or timid. Socialize extensively as a puppy. Because of the dog's hunting instincts, the Brittany likes to roam. They are good with children if they are raised with them from puppyhood and/or properly socialized. It adapts to all types of terrain: woods, plains or hills. It's resistant to cold and damp conditions. It is used especially for hunting woodcock, partridge and hare, and is always active, enthusiastic and untiring. It also has an outstanding instinct for retrieving from water. 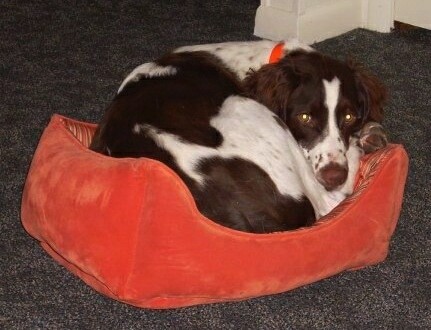 The Brittany has earned great popularity among millions of hunters because of its moderate size, which allows hunters to transport them easily. Because of its jolly character, it is also popular as a companion dog. The Brittany was named for the French province of Brittany and may be the result of crossing the Orange and White Setter along with some not clearly identified French dog. 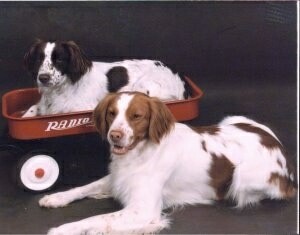 Since the Brittany looks a lot like the Welsh Springer Spaniel some think the two may be related. The breed is one of the most popular pointing breeds for bird hunting. In some countries the breed is referred to as a "Brittany Spaniel," however in the United States it is referred to as just "Brittany." The Brittany was first shown in France in 1896 and first recognized by the AKC in 1934. 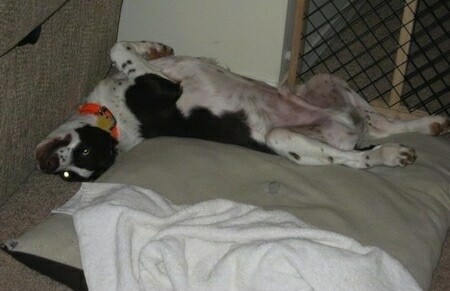 Waylon Jennings the Brittany Spaniel—"Waylon is a connoisseur of comfort. He will find the snuggliest spot in the house, even if it is the cat bed."